Jonathan Jahnke is a visual artist in New Orleans, LA, whose work spans film, photography, paintings, and illustration. 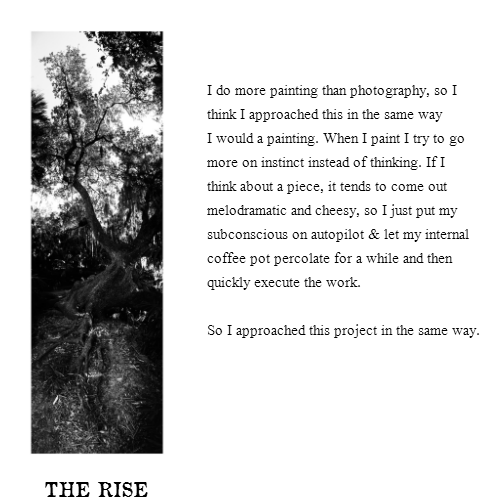 This photo essay is comprised of digitally constructed panoramic images of New Orleans' iconic oak trees. The collection was selected for the 17th annual No Dead Artists juried competition of contemporary visual art at the Jonathan Ferrara Gallery (400a Julia St., New Orleans). The show includes almost two dozen artists from around the nation, including several from the South. It runs through September 28th. SG contacted Jahnke and got him to give us the story behind the photos. Prints are available from Jahnke's website. Due to their long, vertical nature, we've decided to present small versions of the images along with the full-size images. 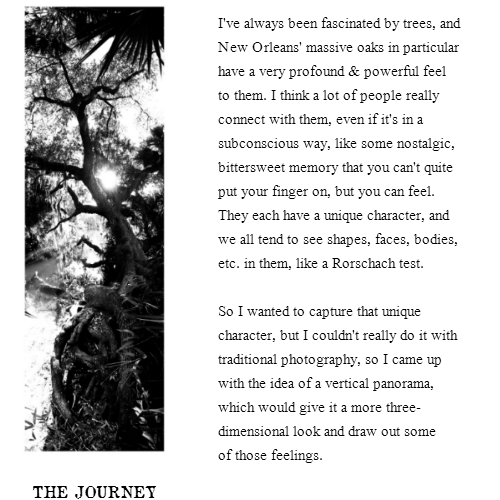 Click on any large image to fit it in a lightbox on your screen.